Preheat the oven to 250, and place a large pan with a cooling rack on it in the oven. 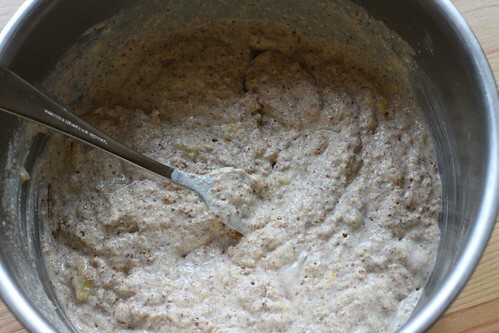 Whisk the flour, flax meal, baking powder and soda, salt and lemon zest together in a large bowl. 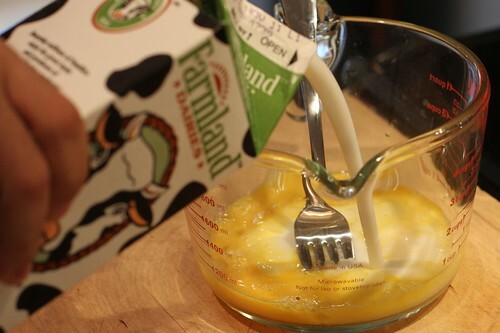 Mix the buttermilk, egg and melted butter together in a separate bowl. 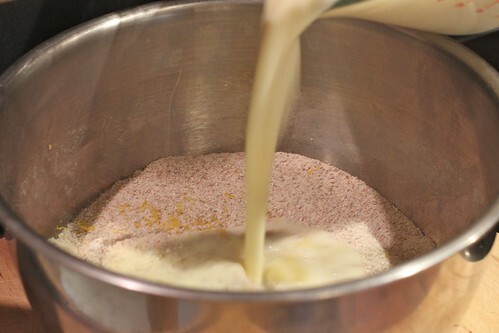 Pour the buttermilk mixture into the flour mixture. 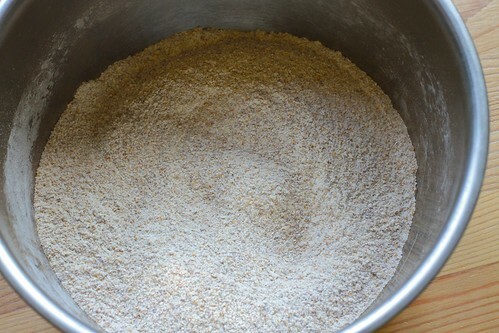 Stir gently with a fork until just combined; the batter will have lots of lumps. 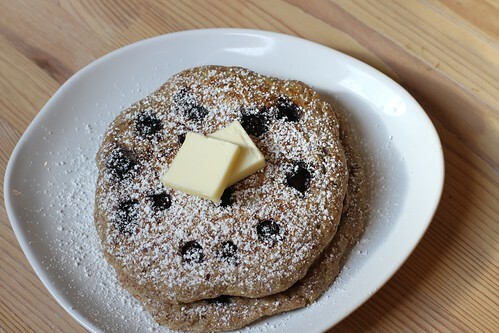 Melt the extra butter in a large skillet or griddle. 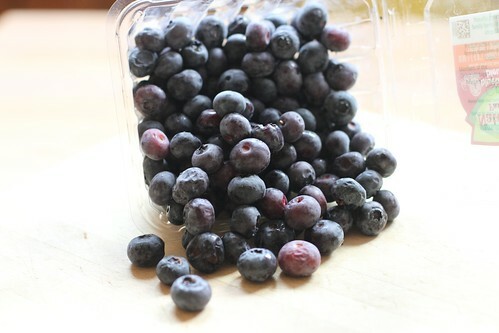 Dollop the batter into the pan with a 1/3 cup measuring scoop and sprinkle with the blueberries. Cook until the pancake bubbles (look closely; it’s a little hard to tell with this thick batter); then flip and cook until browned on the second side. Keep finished pancakes warm on the cooling rack in the oven while you cook up the rest of the batter. Makes 8-10 pancakes. 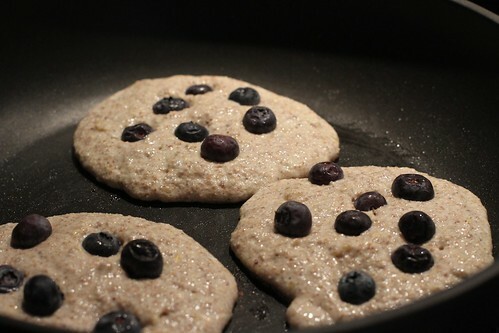 Serve with your choice of pancake topping. 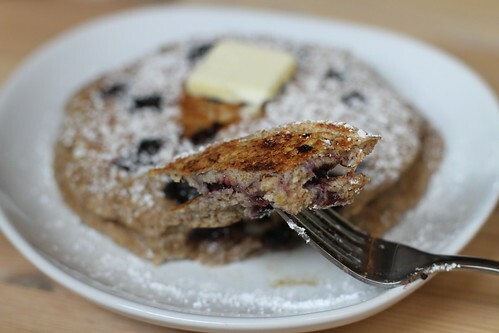 Between the whole whole wheat and the flaxseed, this has to be very filling. Both for you and for the porcelain god. kitty, look forward to hearing how that turns out; we’ve been pondering whizzing some oats in the fopro and giving oat flour a try.